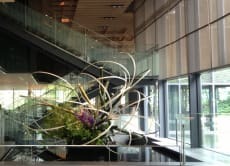 Hi, I'm Satomi and I enjoy Ikebana or Japanese flower arrangement for many years. I'd like to show you some of my favorite spots where you would enjoy the traditional beauty of Tokyo in peaceful and relaxing areas, not known to tourists. with a great view for lunch. It's just a mile's walk tour but still a lot to see. Getting away from chaotic Shibuya and Akihabara, let's find some other faces of Tokyo.